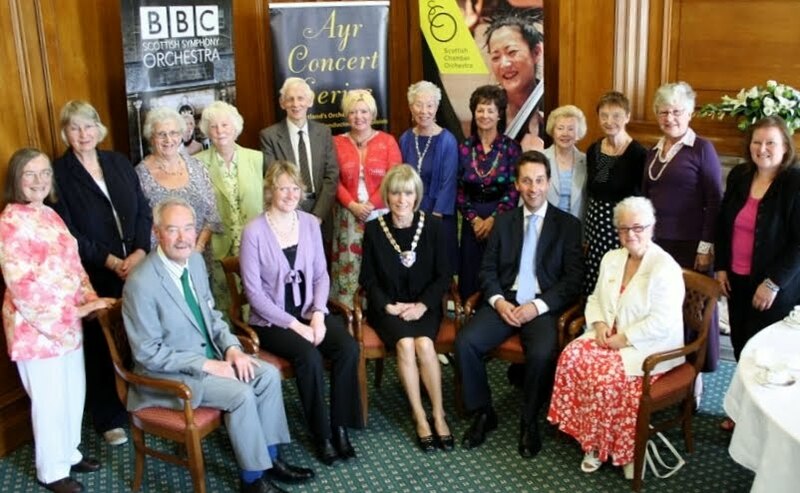 South Ayrshire Provost Winifred Sloan has hosted a civic reception to mark the silver anniversary of the Ayr Concert Series, an annual celebration of classical music showcasing the finest talents in their profession. The Concert Series began in 1987 at Ayr Town Hall and has steadily grown in popularity and scope, attracting performers from all over the world. It has also played host to BBC Scottish Symphony Orchestra, Scottish Chamber Orchestra, the Orchestra of Scottish Opera, Royal Scottish National Orchestra, and the Scottish Ensemble and many world class conductors. Provost Sloan said: “The Ayr Concert Series is no stranger to big names, or extraordinary talent and, even from the first performance back in 1987 we welcomed trumpeter John Wallace, mezzo soprano Christine Cairns and cellist Murray Welsh. “Conducting the Ulster Orchestra that year was Ayr man Bryden Thomson, who sadly passed away in 1991. “His last recordings, of the Symphony No. 4 and Symphony No. 6 of Carl Nielsen are still considered by critics to be among the very best interpretations of those works. “We’ve welcomed stars such as flautist James Galway, Steven Isserlis the cellist, Heinrich Schiff, a cellist and conductor, and Sir Alexander Gibson, who became the first Scottish principal conductor and artistic director of the Royal Scottish National Orchestra in 1959. “Celebrities such as Richard Stilgoe, Jackie Bird, Jamie McDougall, Lisa Milne and Bill McCue are all well known to us through the Concert Series. “On a personal note, I’ve also been thrilled to see the emergence of new talent such as our own wonderfully gifted Nicola Benedetti, who was inspired by the Ayr Concert Series as a child. “But, despite the stars, musicians, orchestras glitz and glamour, the recent success of the Concert Series rests squarely on the shoulders of the Ayr Arts Guild, who stepped in to take over the event management some six years ago. Responding to Provost Sloan, Michael Hitchon, treasurer of the Ayr Arts Guild said: “The Ayr Concert Series is a hugely successful collaboration between the Council and the voluntary sector. “We’re delighted to have our silver anniversary recognised by Provost Sloan and we can promise a bigger and better line up for the Ayr Concert series in 2011/12. “Feedback to the Ayr Arts Guild tells us that we are delivering quality musical masterpieces, clearly being enjoyed by audiences of all ages, from all walks of life and from home and abroad. “Our aim is to build on the success of the past, fine-tuning our offering for the future and I sincerely hope we will celebrate many more musical milestones in the future. “Brochures with details of the concerts will shortly be available to the public, with season tickets on sale from 4 July. Single tickets will go on sale from 15 August. Provost Sloan concluded: “I was delighted to mark the occasion with the Guild and special guests as my own way of saying a big thank to them for all their hard work making sure the Ayr Concert series goes from strength to strength.